Chief Lewis comes with over 31 years of fire and rescue experience including 23 with Fairfax and 19 with VATF-1/USA-1. In addition to being a nationally registered paramedic and holding standard fire and rescue certifications he holds multiple domestic and international response certifications. With VATF-1 / USA-1 he has have deployed both domestically and internationally in a variety of capacities including team management. In addition to response he has also provided domestic and international instruction and evaluation. 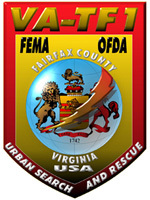 Alfred J Pacifico, is a medical specialist and medical team training lead for Fairfax County Urban Search & Rescue Task Force, designated Virginia Task Force 1 for FEMA response and USA 1 for international deployments through the Office of US Foreign Disaster Assistance. He has been a practicing Physician Assistant for more than 27 years in Critical Care, Emergency Medicine and Occupational Medicine. He has been involved in Fire and Emergency Medical Services for over 32 years and currently is the Assistant Chief with Sterling Volunteer Rescue Squad in Sterling, Virginia. Mr. Pacifico has deployed with the Fairfax County Task Force to the 2015 Nepal Earthquake, South Carolina flooding from Hurricane Joaquin, Matthew, Super Storm Sandy, and a range of full field exercises.